Amazing what you can do when you take action! Brava Anna. You are an inspiration. I know what you mean about her perhaps deserving a different name, like “Amazing Lady.” But to tell you the truth I kinda like “The Lemon Lady,” because I believe she started by gathering all those fallen lemons that go to waste in people’s yards, and because, well, she’s affectionately known by this name — it’s already her. Very cool that you spent time doing rounds with the Lemon Lady and wrote about it. One of the sad things about the declining newspaper industry is that they do, or did, a good job of writing about local heros or inspirational folks. You do this here! Imagine if each one of us just knocked on one or two doors a year? Make it a goal to meet one or two new neighbors with fruit trees each season. Community wide, we could almost solve the fresh produce shortage at food banks. Truly, I believe that. There really is THAT MUCH unharvested fruit out and about. Look around your neighborhoods. You’ll see…and be tempted to knock on doors too! If you need help with an introduction letter or help to get your courage up to knock on doors – give me a call! My original letter is posted on the “news” blogspot. Hopefully, more folks will simply drop off a bag or two of their own excess backyard fruit. In a month’s time, I collected 2,000 pounds of lemons and oranges from front yard trees – trees that were low to the ground. Easy pickings. Imagine what grows behind fences that my eyes have never seen…This project can be much bigger than I have ever dreamed. This time of year, I see pomegranates, persimmons all over town. Lemons actually produce two crops a year in California. They’re everywhere. Great to meet you too Sarah! Hi Anna, I am impressed and inspired by what you are doing. If you use volunteers on your projects, please sign me up. Do you know a source for not very expensive fruit trees? We just spent a few hundred dollars on less than 10 trees and I would like to plant more. I’m quite impressed with your accomplishments and the difference you have made in the community! I also recently spent some time with The Lemon Lady at the Walnut Creek Farmers’ Market where she went through the stalls greeting the vendors and workers in an inspiring display of respect and determination to help those in the community that need help. The result on this day was a pick-up truck full of produce donated to the Salvation Army in Concord and some extra boxes for another effort in Clayton. 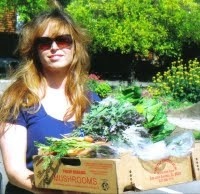 I agree, the way Anna does the rounds at the farmers’ markets is really classy. And congrats to Anna for the recognition of her efforts on behalf of the hungry. Last spring semester I took a class that made me aware of the surplus of lemons not only in my yard but those of my neighbors as well. I would like to connect with you so I could start collecting surplus fruit in my neck of the peninsula. I live in Millbrae. How can I connect with Anna Chan the “Lemon Lady”? Here’s how to reach Anna: http://www.thelemonlady.blogspot.com. Good luck gleaning in your neck of the woods. AH! This is the sort of thing I have been looking for. Doing some research for an article. You should add buttons to the bottom of your posts to digg, stumble, etc. your content. I think this is great and want to share it, but as it stands, I’m a lazy lazy person. Just kidding! Hi there, yes, all those social bookmarking buttons coming soon when I migrate my blog to a hosted site. Thanks for the suggestion and stay tuned for these new developments. Thank you for this introducing us to this remarkable woman, Sarah. What a beautiful and inspiring story! Hi Susan, Nice to see you here and thanks for your kind words.